In the previous post I spent all my time explaining the benefits of Proportional on Measurement. In this post I’ll explain the code. People seemed to appreciate the step-by-step way I explained things last time, so that’s what I’ll do here. The 3 passes below detail how I went about adding PonM to the PID library. The other thing we need to do is allow the user to select whether they want to do Proportional on Error or Measurement. After the last post it might seem like PonE is useless, but it’s important to remember that for many loops it works well. As such, we need to let the user choose which mode they want (lines 51&55) and then act accordingly in the calculation (lines 37&38). While the code above does indeed work, it has a problem that we’ve seen before. 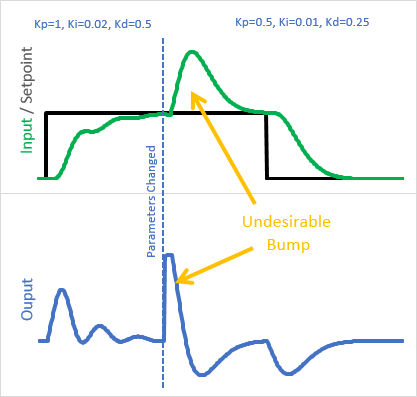 When tuning parameters are changed at runtime, we get an undesirable blip. Final Pass – Sum problems. There are more, but just these are enough to see what the real issue is. We’ve dealt with all of these before, back when we created ITerm. Rather than go through and re-implement the same solutions for PTerm, I decided on a more aesthetically-pleasing solution. By merging PTerm and ITerm into a single variable called “outputSum”, the P_ON_M code then benefits from the all the ITerm fixes that are already in place, and because there aren’t two sums in the code there isn’t needless redundancy. And there you have it. The above functionality is what is now present in v1.2.0 of the Arduino PID. But wait, there’s more: Setpoint Weighting. I didn’t add the following to the Arduino library code, but this is a feature that might be of some interest if you want to roll your own. Setpoint Weighting is, at it’s core, a way to have both PonE and PonM at the same time. By specifying a ratio between 0 and 1, you can have 100% PonM, 100% PonE (respectively) or some ratio in between. This can be helpful if you have a process that’s not perfectly integrating (like a reflow oven) and want to account for this. Instead of setting pOn as an integer, it now comes in as a double which allows for a ratio (line 58.) In addition to some flags (lines 62&63) weighted Kp terms are computed on lines 77-78. Then on lines 37 and 43 the weighted PonM and PonE contributions are added to the overall PID output. It’s been quite a while, but I’ve finally updated the Arduino PID Library. What I’ve added is a nearly-unknown feature, but one which I think will be a boon to the hobby community. It’s called “Proportional on Measurement” (PonM for short). There are processes out there that are known as “Integrating Processes.” These are processes for which the output from the pid controls the rate of change of the input. In industry these comprise a small percentage of all processes, but in the hobby world these guys are everywhere: Sous-vide, linear slide, and 3D printer extruder temperature are all examples of this type of process. Overshoot can still happen to be sure, but it’s not unavoidable. With PonM and the right tuning parameters, that sous vide or linear slide can coast right in to setpoint without going over. So What is Proportional on Measurement? 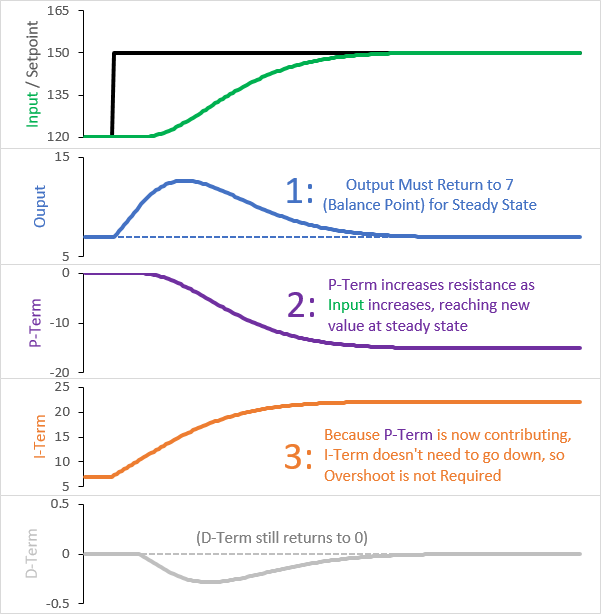 Similar to Derivative on Measurement, PonM changes what the proportional term is looking at. Instead of error, the P-Term is fed the current value of the PID input. Unlike Derivative on Measurement, the impact on performance is drastic. With DonM, the derivative term still has the same job: resist steep changes and thus dampen oscillations driven by P and I. Proportional on Measurement, on the other hand, fundamentally changes what the proportional term does. 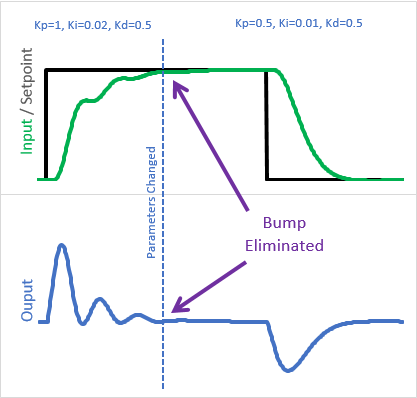 Instead of being a driving force like I, it becomes a resistive force like D. This means that with PonM, a bigger Kp will make your controller more conservative. Great. But how does this eliminate overshoot? When we’re at setpoint, the I-Term is the only contributor to the overall output. 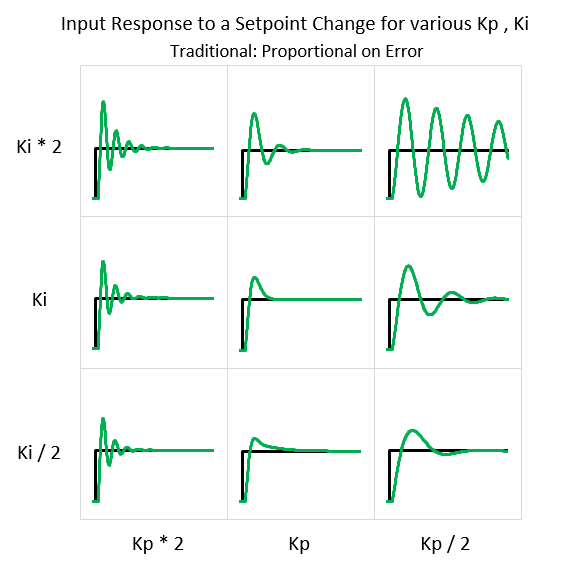 Even though the setpoint is different at the start and end, the output returns to the same value. 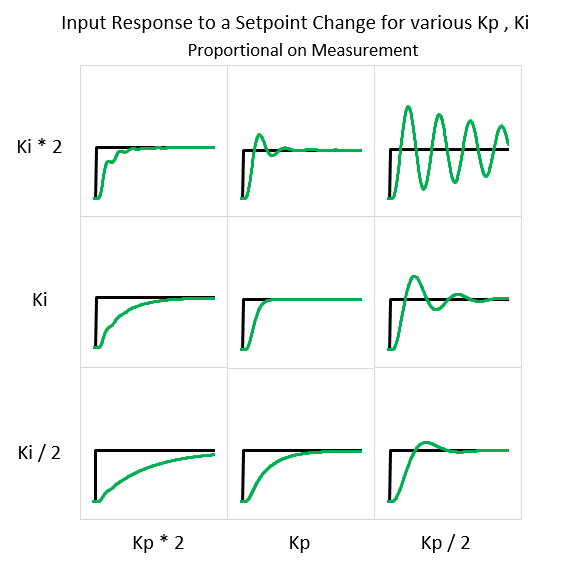 This value is generally known as the “Balance Point”: the output which results in 0 Input slope. For a sous-vide, this would correspond to just enough heat to compensate for heat-losses to the surroundings. Here we can see why overshoot happens, and will always happen. When the setpoint first changes, the error present causes the I-Term to grow. 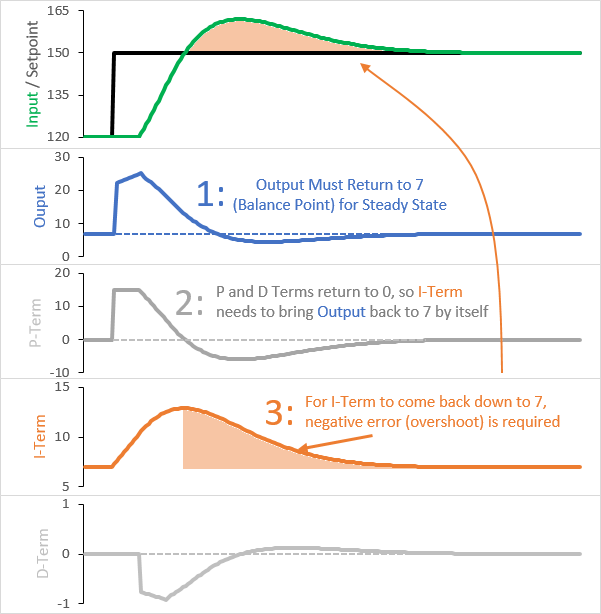 To keep the process stable at the new setpoint, the output will need to return to the balance point. The only way for that to happen is for the I-Term to shrink. The only way for THAT to happen is to have negative error, which only happens if you’re above setpoint. The P-Term is now providing a resistive force. The higher the Input goes, the more negative it becomes. Where before the P-Term became zero at the new setpoint, it now continues to have a value. The fact the the P-Term doesn’t return to 0 is the key. This means that the I-Term doesn’t have to return to the balance point on its own. P and I together can return the output to the balance point without the I-Term needing to shrink. Because it doesn’t need to shrink, overshoot isn’t required. You only need to call the overloaded method when you want to switch. Otherwise you can use the regular SetTunings function and it will remember your choice. You are currently browsing the Project Blog blog archives for June, 2017.